The 1970 Mustang Mach 1 came only on the fastback body style. Factory options included: 351ci 4-barrel engine, 3-speed manual transmission, Ford 9 inch 3.00 standard axle ratio, black hood stripe, F70x14 belted tires, power steering, AM radio, tinted glass, front bumper guards, and tachometer. Wimbledon White 1970 Mach-1 Mustang fastback owned by Bill Hamilton from Charleston, South Carolina. This was our featured Attitude Of The Week photo for the week starting October 18, 2009. Bill tells us, "This is my third 1970 Mustang. My first new car was a 1970 Grabber Sportsroof Package Mustang in 1970. I owned that car for 22 years. I also owned a 1970 Mustang convertible for a few years in the mid-70s with the 428 SCJ package with Factory Drag Pack and 4:30 gears. My present 1970 Mach 1 has been with me since 2004. It has been retro-modded with a modern 5-speed and Mustang II rack and pinion steering. It has headers, Edelbrock intake manifold, and a 670 CFM Holley Street Avenger carb. It has a 1.125" front sway bar and 0.875" rear bar plus Bilstein gas shocks. It's been dynoed at 250 rwhp and has gotten 25+ mpg on the highway with the stock 3.00 rear gears." This Red 1970 Mach 1 Mustang fastback was originally painted Bright Gold. Factory options included: 351ci 4 valve engine, 3-speed manual transmission, Ford 9 inch 3.00 standard axle ratio, black hood stripe, F70x14 belted tires, power steering, AM radio, tinted glass, front bumper guards, and tachometer. The owner removed the bumper guards and added the front and rear spoilers. Medium Lime Metallic 1970 Mach 1 fastback owned by Raynald BÃ©langer from Boucherville, QuÃ©bec, Canada. This car was our featured Attitude Of The Week for 08-31-08. Under the hood is a 351ci 4V Cleveland with factory air conditioning. This car is among the best restored Mach-1s in the world with 768 out of 800 points MCA Concours. Its full concours restoration was guidelined and detailed by Mustang International, a division of Musclecars International. Raynald also did some of the detailing. 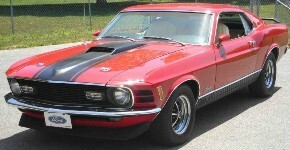 He is a 1969-70 Mustang Club of America certified judge and founder/administrator of the 1970 Mustang Mach1 World Registry (http://www.homestead.com/1970mach1/home.html). Jeff Speegle MCA National Head Judge also helped. It is completely restored to factory specifications with paint marks from all assembly manuals. The restoration of this Mach 1 was started in 1997 and completed in April 2000. 2000 hours of labors were required to detail and put this car in this incredible condition. VIN number is located on VIN tag on the dash, door tag, body tag, and fender apron. This Mach 1 was sold new by Sunset Ford in Westminster, California. It has been featured in a couple of magazines and TV shows; Canadian Classics Magazine September 2000, Mustang Times May 2001, SMAC Magazine Vol 2 no 3 2003, V-8 Passion Magazine October 2004, Invitational at All-Ford Nationals at Carlisle PA in June 2001, and a TV Show Auto Stop in February 2003. Dark Ivy Green 1970 Mustang Mach-1 fastback with a Optional Super Cobra Jet 335hp V8. The door data tag on this car reads 63C fastback Mach 1 body style, C Dark Ivy Green metallic exterior paint, 3A black Mach 1 knitted vinyl interior, V 3.91:1 limited slip rear axle, 6 4-speed manual close ratio transmission (changed on this car to automatic), 16 originally ordered in the Philadelphia area. Take a look at this Grabber Blue 1970 Mach 1 Mustang fastback. It was our Attitude Of The Week featured picture for the week of 8-12-07. Factory options include: Options: Mach 1 package, 428ci SJC engine with drag pack, 4-speed close ratio manual transmission, black hood stripe, dual paint stripe, convenience group, F70x14 belted tires with raised white letters, AM/FM stereo radio, Tinted glass, front chin spoiler, and rear spoiler. Check out this gray 1970 Mustang Mach-1 fastback owned by Tom Rose. It has a 351ci Ford Racing engine, TK6 manual transmission, stainless exhaust system with Corsa mufflers. rack and pinion steering, and leather interior. Red 1970 Mach 1 Mustang fastback owned by Mike Cargol from The Woodlands, Texas. This was our featured Attitude Of The Week photo for the week starting April 25, 2010. Mike adds, "It was originally a 351C 2v, but has been 'upgraded' to a 4v (heads & carb). Other mods include 17x8/17x9 Classic 100C-Series rims with Nexen rubber and front spoiler." Grabber Orange 1970 Mach I Mustang with the Super Cobra Jet 360hp (at 5400rpm), 428 cubic inch, V8 engine with Ram Air induction. This was the first Mustang production year of the Grabber Orange color, the Shelby Mustangs used this color for the first time a year earlier. Unlike most 1970 Mach I's, the hood air scoop is functional due to the Super Cobra Jet engine underneath. Bright Gold 1970 Mach 1 fastback with a 428ci Cobra Jet engine, close ratio 4-speed manual transmission, and the 3.25 rear end. This drivetrain is original to the car. Candy Apple Red 1970 Mach 1 Mustang fastback owned by Paul Stein from Fergus Falls, Minnesota. This was our featured Attitude Of The Week for the week starting September 19, 2010. "This is the car I drove by on my way to work. I could not help loving it. She was owned at the time by an Auto Detailer in Bloomington, Minnesota. As luck would have it, one fall November day in 1982 as I was pulling into my previous employer Freeway Fords lot, there she sat in the used car row. Further investigation led me to find out that she was there for sale on consignment. Well as soon as I could, I went to visit its owner and inquired about the Stang. We came to an agreement that if it did not sell at Freeway, I could buy her for $2800. Well being the time of the year it was, she did not sell for Freeways asking price and the deal was made between its owner and I. It was not easy to put together the $2800 then but with help from Family, I was able to seal the deal after Thanksgiving 1982. I know little of its owner who originally put the car into the state it is in today. As you see it now is the way it looked when I purchased it. I do know it was painted its Candy Apple Red color while he was going to Auto Body class at Dunwoody in Mpls sometime in the late 70s. As you can see, the paint is holding up pretty well." Medium Bright Blue 1970 Mustang Mach-1 fastback with a 300hp (at 5400rpm), 351 cubic inch, 4 barrel V8 engine. The data tag on this car reads 63C for the Mach 1 sportsroof body style, 6 Medium Bright Blue Metallic paint (Ford #3077-A), 3B Medium Blue Clarion Knit/Corinthian vinyl bucket seats, 9 3.25:1 axle ratio, 5 4-speed wide ratio manual transmission, and 71 ordered in Los Angeles area. Calypso Coral 1970 Mustang Mach-1 with a 335hp (at 5200rpm), 428 cubic inch, 4 barrel, V8 engine. The Mustang grille emblem did not come standard with any 1970 sport packages. The door tag of this car reads 63C fastback Mach 1 body, 1 a color code of Calypso Coral, 3A black clarion Knit / Corinthian vinyl bucket seats, A 3.5:1 axle ratio, 6 four-speed close ratio manual transmission, 46 ordered in Indianapolis, and assembled on August 8, 1969 (yes this is one of the first 1970 cars assembled). Green 1970 Mustang Mach-1 fastback with a 300hp (at 5400rpm), 351 cubic inch, 4 barrel, V8 engine. This might be the official Medium Lime metallic paint used on 1970 Mustangs, but the photos appear a bit washed out. Medium Blue metallic 1970 Mustang Mach 1 fastback with a 250hp (at 4600rpm), 351 cubic inch, 2 barrel, V8 engine. 1970 Mustang Mach 1 fastback repainted in its original factory Medium Gold metallic color with a 250hp (at 4600rpm), 351 cubic inch, 2 barrel, V8 engine. Calypso Coral 1970 Mustang Mach 1 fastback with a powerful 300hp (at 5400rpm), 4 barrel, V8 engine. Red 1979 Mach 1 Mustang fastback owned by Ruggero Ruggeri from Staten Island, New York. It has the original 351ci 2v V8 engine with the shaker hood scoop and an automatic transmission. Ruggero tells us, "It has factory A/C., original rim blow steering wheel, correct AM/FM stereo radio, all working gauges, Deluxe interior, FMX transmission, 3.00 rear, numbers matching, original color, original purchase order and invoice, Marti Report, and 9614 miles on odometer"
Red 1970 Mach-1 with a Shelby body kit owned by Lee Jachter from Morrison Colorado. The paint is a mid 80s Ford Bright Red. Lee tells us more, "Completely redone Mach 1. Near new car. Zero miles. Fiberglass Shelby body parts. 390GT, Toploader, Leather interior. New wiring, Vintage Air. Should be on the road before new years. Seams eliminated, custom, Shelby drop in front. 9" on Traction Masters in back." Grabber Blue 1970 Mustang Mach 1 fastback with 351 cubic inch, originally 2 now 4 barrel V8 engine. Wimbledon White 1970 Mustang Mach 1 fastback with an optional 250hp, 351ci, V8 engine. Dark Ivy Green 1970 Mach 1 Mustang fastback owned by Mark from Melbourne, Victoria, Australia. This is our featured Attitude Of The Week for the week starting October 26, 2014. This Mach-1 has its original 351ci 4V V8 engine and an automatic transmission. Restored Calypso Coral 1970 Mustang Mach 1 fastback which has a restored 335hp (at 5200rpm), 428ci, 4 barrel, Super Cobra Jet, V8 engine (not quite in the car at this time, but there is an interesting photo of it in this set outside the car). The door data tag reads: 63C Mach 1 fastback/sportsroof body style, 1 Calypso Coral Paint (Ford #1730-A), 3E vermillion clarion knit with corinthian vinyl bucket seats, S 3.50:1 Traction-Lok rear axle, 6 four-speed close ratio manual transmission, and 72 ordered in the San Jose area. Competition Yellow 1970 Mustang Mach 1 fastback with a 335hp (at 5200rpm), 428ci, 4 barrel, ram air, Super Cobra Jet, V8 engine. The door data tag reads: 63C Mach 1 fastback/sportsroof body style, D Competition Yellow exterior paint (Ford #3470-A), 3A Black Clarion knit with Corinthian vinyl bucket seats, 6 3.00:1 standard rear axle, U C-6 Cruise-O-Matic Transmission and 13 ordered in the New York area. Red 1970 Mustang Mach 1 fastback with a 300hp (at 5400rpm), 351ci, 4 barrel, V8 engine. Silver 1970 Mustang Mach 1 fastback with a 250hp (at 4600rpm), 351ci, 2-barrel, V8 engine. This photo was taken outside the Ford headquarters in Michigan. Options on this Mach 1 include: deluxe Mach 1 interior, deluxe Mach1 luxury trim, black hood stripe with functional hood scoop and built-in turn indicators, evaporative emissions equipment (California Smog), FMX Select Shift Cruise-O-Matic automatic transmission, power front disc brakes, power steering, tinted glass, air conditioning (Dealer Option), and an AM radio which has been upgraded to a factory Ford AM/FM stereo. Competition Yellow 1970 Mustang Mach 1 fastback with a Cleveland, 351 cubic inch, 2 barrel, V8 engine. Chestnut 1970 Mustang Mach 1 fastback with a 300hp (at 5400rpm), 351 cubic inch, 4 barrel, V8 engine. There were 339 Mustangs painted this color (Chestnut metallic or color code Y) in 1970. In 1969, color code Y was Indian Fire Red, which is very similar. Original Pastel Blue 1970 Mustang Mach 1 fastback with Magnum 500 wheels, metal rocker panel trim, black hood stripe, hood scoop, front air damp, rear spoiler, color keyed mirrors, and a 351ci 2-barrel V8 engine. Light Ivy Yellow Mustang Mach 1 fastback with a 351 ci, 2 barrel, V8 engine, Crager SS wheels. Grabber Blue 1970 Mustang Mach 1 fastback with a 300hp (at 5400rpm), Cleveland 351ci, 4 barrel, V8 engine. This Mach 1 has metal rocker panels with the Mach 1 lettering; Magnum 500 wheels; flat black hood stripe, air dam, and hood scoop. This is a Medium Blue 1970 Mach-1 Mustang fastback with a matching medium blue interior. It has the H-code 351ci engine with a 2-barrel carburetor, a 4-speed close ratio manual transmission, connected to a 3.25 rear end. Medium Bright Blue 1970 Mustang Mach 1 fastback with a Ram Air, 351 cubic inch, 4 barrel, V8 engine. In 1970 the optional hood clips from 1969 were replaced with new twist-in pins and a shaker hood scoop was available with the 351 V8 as shown here. Other 1970 Mach 1 features included a new front end, taillights recessed in a flat panel with honeycomb trim between them, and aluminum ribbed rocker panels with Mach 1 lettering. Wow check out this 1970 Mustang Mach 1 fastback which has been restored to its original Medium Red exterior paint with white hood stripe and Mach 1 metal rocker panel trim; vermilion red interior; and 250hp (at 4600rpm), 351 cubic inch, 2 barrel V8 engine. This is an excellent shot for a desktop wallpaper. This is a 1970 Mustang Mach-1 Twister Special. This was a local promotional special model sold only in the Kansas City area. They were all Grabber Orange Mach-1 Mustangs. Only 96 units were produced. There is a tornado Twister graphic on the rear fenders. mustang Did Ford really make a Purple 1970 Mustang Twister Special Mach 1 Mustang? Well, at least a 1/18th scale, die cast model was made of one. We are looking into the references of a 1967 Twister Special Mustang offered in the Alabama, Arkansas, Mississippi, and Louisiana area. If you have more information on this toy or a purple Twister Special, let us know. Dark Ivy Green 1970 Mustang Mach 1 fastback with black stripes. Check out the wide chrome Magnum 500 wheels. This photo was taken at a rainy All Ford car show at Uftring Ford in East Peoria, Illinois. A good thing about attending a car show in the rain is that you don't have to wait for people to move out of the way to take photos. Bad thing about attending a car show in the rain is that you cannot talk with the car owners. Take a look at this awesome Grabber Orange 1970 Mustang Mach-1 on display at the rainy 2009 All Ford Show at Uftring Ford in East Peoria, Illinois. It was starting to rain harder here, check out the rain drops hitting the pavement in the lower left corner of this shot. Check out this Grabber Orange 1970 Mach 1 Mustang fastback at the 2010, Port Angeles, Washington, Mustang car show. Check out this Calypso Coral 1970 Mustang Mach-1 fastback. This car has a red interior. Under the hood is the 250hp 351ci 2-bbl V8 engine. This car was being shown at the 29th Annual Central Illinois Ford Day Show in Bloomington, Illinois. This Grabber Orange Twister Special Mach 1 Mustang was at the 2010 MCA Grand Nationals. 96 of these specially ordered, sequentially numbered, Mach 1's were part of a special promotion in Kansas City featuring high performance cars. Check out this Champagne Gold 1970 Mach 1 Mustang fastback. It has the Mach-1 rocker panels. I like the wheels. This car was on display at the 2010 Ufring Ford Mustang and Ford show in East Peoria, Illinois. Check out this Grabber Orange 1970 Mach-1 Twister Special fastback. It was on display at the 2010 Mustang and Ford car show at Uftring Ford in East Peoria, Illinois on September 19th, 2010. These are pretty rare cars. It was under the roof of the dealership. This Dark Ivy Green 1969 Mach-1 Mustang fastback with Cragar SS wheels and Cobra Jet Ram Air V8 engine was at the 2010 Mustang Club of America Grand Nations held in Bellevue, Washington. Red 1970 Mach 1 Mustang fastback with Magnum 500 wheels and 428ci Cobra Jet Ram Air V8 engine. This Mach 1 was at the MCA Grand Nations in Bellevue, Washington. Medium Bright Blue 1970 Mustang Mach 1 sportsroof at the 2010 MCA Grand Nationals held in Bellevue, Washington. This Competition Yellow 1970 Mustang Mach 1 sportsroof with Shelby style wheels was at the 2010 Mustang Club of America Grand Nationals held in Bellevue, Washington. Grabber Orange 1970 Mustang Mach 1 at the 2011 Mustang Roundup car show held in Bellevue, Washington. Its parked next to a the newer Grabber Orange Mustang with four 1968 Mustang GT California Special Mustangs in the background. This customized Red 1970 Mach 1 Mustang was at the 2010 Mustang Roundup car show in Tampa, Florida. It has customized wheels, engine, and dash gauges to name a few. This amazing Calypso Coral orange 1970 Mustang Mach 1 was at the 2010 Mustang Roundup car show held in Bellevue, Washington. This car has a 351ci 4V V8 under the hood, automatic transmission, and added Magnum 500 wheels. Wimbledon White 1970 Mustang Mach 1 sportsroof with black hood stripes and die-cast center deep dish sports wheel covers. According to the 1970 Ford Mustang promotional brochure these wheels came standard on the 1970 Mach 1. This car was at the 2010 Mustang Roundup car show held in Bellevue, Washington. This is an excellent Ford promotional photo of a Grabber Orange 1970 Mustang Mach 1 Twister special. Featuring a tornado Twister graphic on the rear fender, only 96 units were produced. This amazing Grabber Orange 1970 Mach 1 Mustang is a Twister Special replica. I was driving through Bellevue, Washington and couldn't believe what I saw for sale at a local car dealer. So I went right home to get my camera, and it was our Attitude Of The Week for the week starting August 7th, 2011. Check out this spooky Calypso Coral 1970 Mach 1 Mustang fastback. This is our Attitude Of The Week for the week starting October 31, 2011. This car was photographed at the 33rd annual Mustang and All-Ford Show in Springfield, Illinois this summer. Photo was taken by and edited by Jessica Klein. More shots of this Mach-1 to follow this evening.